So much for being back to a normal schedule; it definitely didn't last long! Xander has had ear troubles since he was small and this week was a rough ear week for us. We had a HORRIBLE visit to the ENT that had us both in tears (although his was more like shaking, thrashing screams than tears) and we have to go back in a couple of weeks. He lost a tube, has a plugged non functioning tube that we're trying to save, and he has fluid behind each ear drum. He didn't sleep well and basically just wasn't himself. Needless to say, some days he just wasn't in the mood for Tot School, so we just skipped it those days. That's why there are so few pictures. Luckily, he seems to be feeling better now, so hopefully we will have better news next appointment. 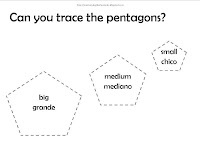 This week's shape was pentagon and it was our second week using the Traffic Sign Theme. Traffic Sign Printables. We used our shape cards. We also used some pocket chart phrases from our Pentagon Printables. A tracing page he did NOT want to do this week. We still "played" with his cards from the Traffic Sign Printables. We used Little Reader quite a bit. It seems even when he isn't feeling well, he just can't get enough of looking at the words, although he gets picky about which words he wants to see. We also did a lot of space themed work box activities. I will post those on Wednesday under the new tag of Brain Building Boxes! I also started a linky for tot trays, boxes, busy bags, etc. that I am hoping to do every Wednesday so please link up!. 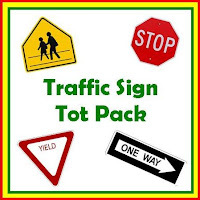 Check out our Tot School Posts using this tot pack! 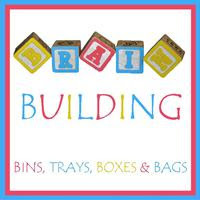 Check out our Brain Building Boxes using this tot pack! These are the boxes from last week, so they happened during our Octagon Week and our Traffic Sign Theme. I try to have the activities link in when I can, but don't feel constrained by making them fit. I don't intend all of the activities to be done independently. Most requiring scaffolding from me. Like the majority of the boxes this week, this activity came from my Traffic Sign Printables. Xander loves the traffic signs, but I really wanted him to focus on their shapes. He did a great job matching, but couldn't be bothered liming up the cutouts. This was Xander's favorite box, even though he wasn't very good at it. It had half of the wooden signs from his traffic set, and then little cards to match them to. He was really good at some of them, like the stop sign, but can't read the other cards, which is really my fault. I had intended to make a LR lesson to go with this unit but never got around to finishing it. He still loved it and was able to match things if I read the cards he didn't know. This box had a sheet another sheet from the Traffic Sign Printables. Xander can read his a lot of his shapes, but still needs practice with a few. This page had signs with the name of a word and then sign cutouts to go with. He enjoyed it and did pretty well, but it was another activity that required me pointing out the shape of the sign because he would get so caught up in the sign itself. Pretty self explanatory. Xander really struggled with pinching the clothespins, so I was excited to find some easier plastic clothespins at the dollar store part way through the week. He is so much better with them and can do the activity as intended. Boggle Jr has been sitting in our basement for a while. I got out just one card and the letters that went with it to see if Xander could match. He did ok matching if I set the blocks up for him, but he really struggled if he knocked them over or picked them up and set them down on a different side. I think we need to stick to activities with only one letter per object. Oh well, how would I know if I hadn't tried. He still really liked it. One of our shelves had Cariboo on it. It was a game that my step daughter had had and loved, so when I saw it at a garage sale for $2, I had to pick it up for Xander. He is still technically too young to really play, but I got it out to see how he would do. He aboslultely LOVED using the little key to find the balls and open the treasure chest. We quickly gave up playing by taking turns choosing cards. In fact, I ended up just putting the cards away and letting him open the compartments with the "key." He loved it and I figured it was good fine motor work. This Melissa and Doug Traffic Sign puzzle was PERFECT for this week's theme (of course I can't find the link to it anymore, but here is a similar puzzle). Actually, I got it for Xander for Easter thinking we may end up doing a traffic sign theme. Even though the slots where the pieces go, he did a good job putting it together when I reminded him about the shapes of the pieces, not just what signs they were. Since I am always looking for new ideas for our boxes, I decided to start a Linky. Have you posted about any sort of brain buidling work boxes, tot trays, busy bags, etc? Feel free to link up! All I ask is that you add the Brain Building Lynky button (in the sidebar) or a link back somewhere on your post. Thanks! Vacation was wonderful, but it was so nice to be back on a more normal schedule again! 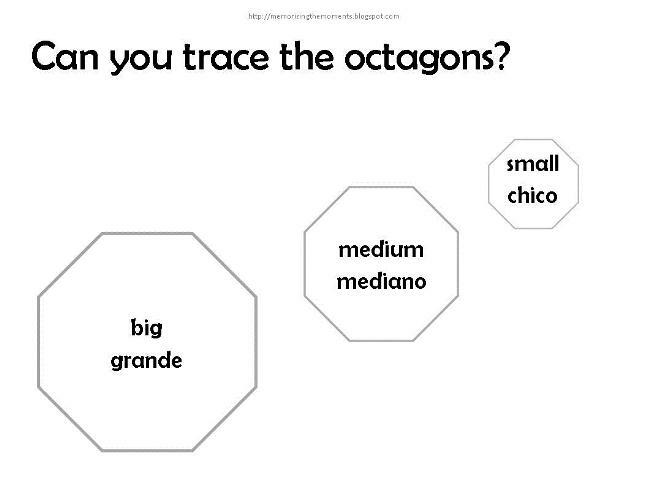 Last week's shape was the octagon and the theme was traffic signs. Xander has a thing for stop signs, so he loved the theme! I liked that it let us work in a lot of other shape review. Below was the shelf for the week. Not too many books, just ABC Drive, Signs in Our World, Go Far in the Car, and the little book I made with the Traffic Sign Printables. We used our shape cards. 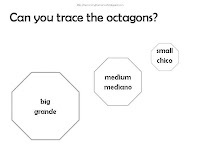 We also used some pocket chart phrases from our Octagon Printables (The typos from the pic are fixed in the uploaded version). In addition to his usual tracing page, I made a traffic sign tracing page. We traced the shapes together while we talked about them, then he went nuts coloring all over it. Thank goodness for the dry erase crayons, definitely saved me some messes this week. Hard at work on his color page (in the Octagon Printables). I made some three part cards for Traffic Sign Printables, unfortunately my color ink ran out while printing and the ink I ordered hasn't arrived yet, so I only got to print part of them. Some of the word labels went missing this week. Regardless, Xander liked looking through them on our pocket chart. For some reason he didn't think we should use these cards just on the floor. Doing some little traffic sign puzzles. Loves to match them, but still can't line them up. This week Xander rediscovered his Tag Jr (Great $4 consignment find. I have seen it on sale around the holidays, but can't see paying full price for it). It really seemed to figure out how to use it. He did lots of Mr Brown Can Moo and the Cars Shapes Book. We used Little Reader quite a bit. I made him a traffic sign lesson and he absolutely loves when I use it for super speed flashing sessions. Not really shape or traffic related, but for some sensory play I filled up his water table with water and dish soap. I threw in his Ocean Toob and let him have a fun finding the animals. Notice his "I'm too busy for you to be taking pictures" face.